Just yesterday, Italians celebrated the Feast Day of Saint John—or the Festa di San Giovanni—with food, fireworks, and showy pageantry. At least, that’s how citizens marked the day in some of Italy’s biggest and most cosmopolitan cities. 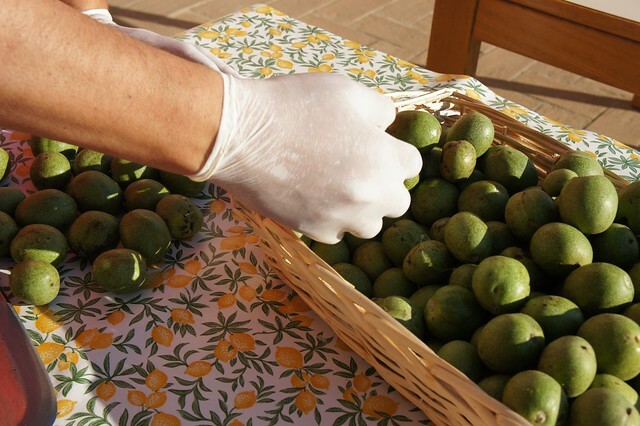 In the quiet countryside, however, this saint’s day was observed with a much humbler but no less traditional rite: gathering green walnuts to put up the annual batch of one of Italy’s most popular digestive liqueurs, Nocino. 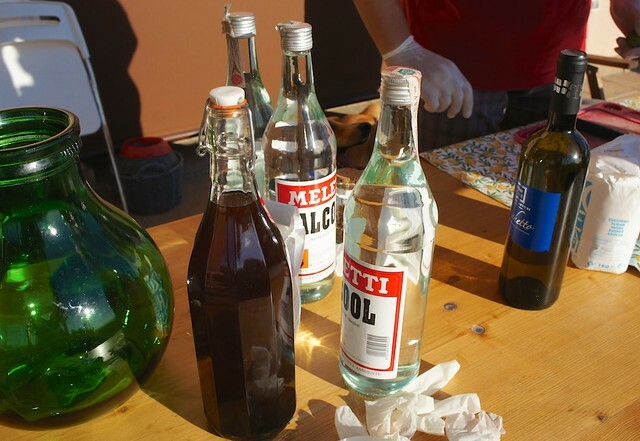 Italians have penchant for digestivi (the function of which, as the name suggests, is to settle the stomach after overindulging at the table), especially amari, or those bitter elixirs made with infusions of either plants and vegetables or a complex mix of herbs and spices. Mouth-puckeringly alcoholic and tongue-blisteringly aromatic, these drinks are not for the faint of heart (or liver). There are a number of digestivi that any restaurant or home cook will have at the ready to finish off a meal--measuring out no more than three or four sips to be presented in tiny digestivi glasses--but the one served with most pride is the house Nocino. The main ingredient of this ancient liqueur, the first mention of which is found in Medieval monastic archives, and the element from which its name derives, is green walnuts. Said to be best picked directly from the tree at dawn on the Feast Day of Saint John before the dew dries, these bright green, unripe nuts are sliced open (staining the hands black for weeks) and macerated in alcohol with a number of other flavorings, according to the (often family) recipe and the region in which it is made. The most common secondary ingredients are cinnamon and clove, lemon zest, rose petals, and vanilla bean, though there are as many recipes as there are producers (a hint: many older family recipes call for exactly 33 nuts, recalling the years Christ lived), and most jealously guard their secrets. After about a month, the by now almost black infusion is strained, combined with a sugar syrup, and strained again. Best aged, a good Nocino is usually served a minimum of six months (but better a year) after being bottled...and traditionally never before All Saints’ Day. 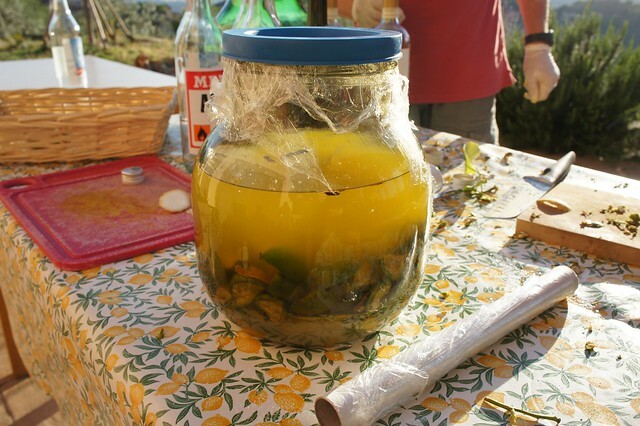 Though this digestivo can be found across Italy—either made commercially or at home–it is most popular in the center and north of Italy where walnut trees are more common and the deep, complex flavor of the drink is more suitable to the cooler climes. Common in Tuscany and Umbria, Nocino from Modena and environs in Emilia Romagna is especially prized and there are a number of local events and festivals every year celebrating this amaro. Tweetable: Is Italy’s strong digestive liqueur Nocino too much for your palate? Try it over gelato! We’ve made it ourselves with friends at a hilltop house in the Umbrian countryside. 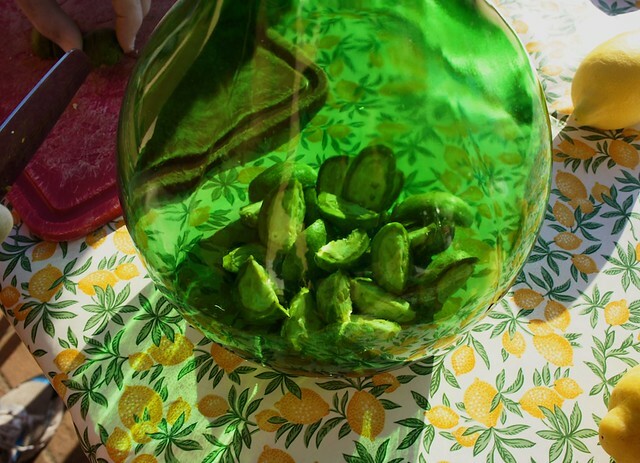 The hosts provided the walnut tree laden with green fruit, and the roughly 20 guests each brought their own special blend of ingredients to add to the infusion. After spending the afternoon putting up our Nocino, the group sat down for a long dinner, capped off, of course, with a tasting of the previous year’s batch. If you find the strong flavor is too overpowering, try a few spoonfuls dribbled over a scoop of gelato alla crema or use it to flavor your own homemade ice cream or custards. The rich, nutty, almost roasted coffee bean aroma is intoxicating, and paired with something sweet and creamy that undercuts enough of its bite to make the decisive taste pleasant to even the most sensitive of palates means that everyone can enjoy this uniquely rural Italian treat.